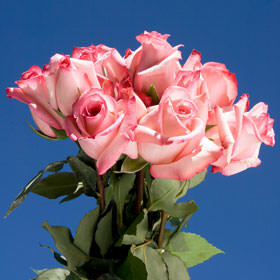 The Michelle Rose is a light pink bud that is lined with a slightly darker pink at the rim of its petals. Pink blossoms have been used in art work throughout Europe for centuries to symbolize intimacy and beauty. They are an excellent floret with exceptional beauty that reveals itself when it is fully bloomed. At your next event if you wish to send the messages of love, beauty, and admiration, They are the perfect choice as these buds are well suited for any major or minor event. We provide bulk orders at wholesale prices so do not be shy to order however many you need for whatever occasion you are planning for. Globalrose runs industry leading facilities that follow some of the toughest environmental regulations. We choose to do this because we believe that environmental protection is everyone's duty. We have our greenhouses growing Michelle Roses all year round to be able to provide three-hundred and sixty-five day availability. Our online store is open twenty-four hours a day so you can order whenever you are in need. We ship all of our products via FedEx because we know they provide some of the best service in the world. All our blossoms are sent freshly cut so their buds will not be in bloomed; please allow two to three days for your Michelle Roses to fully blossom.